A New Definition of Philanthropy: Philanthropy as a global value, as a call to action and how change through philanthropy is within reach for all. Why Give? 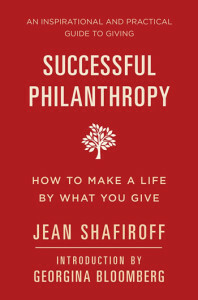 The gift of giving, overcoming obstacles when giving and the author’s personal anecdotes of the experience of giving. Building a life around giving: The Who, What, When and Where of Giving and the benefits of what you have to offer. How to Choose a Charity: Finding a passion and a cause you support, the various categories of charities and causes, where to research a charity along with the expectations and requirements of serving on a board. How to treat volunteers, paid employees, those serviced by a charity, and donors. Communities built on giving: Socializing for a cause and cities known for giving back including New York City, Palm Beach, Los Angeles, San Francisco and Southampton, NY. Establishing a family legacy of giving to others. Generational giving: teaching the importance of giving to children and a guide to philanthropy for retirees and empty nesters.